Gardai have arrested a young man after a pensioner was found dead in a pool of blood in his home with horrific head injuries. The 21-year-old, who was known to Joe O'Callaghan (66), voluntarily presented himself at Togher Garda Station just hours after the body was found. The young man, who is from Cork, can be questioned for a period of 24 hours before gardai must either charge or release him. The body of Mr O'Callaghan, a father-of-three originally from Grange in Cork, was discovered in his bungalow off Galway's Lane, in Douglas, at 8am yesterday by his shocked wife, Angeline. Gardai are expected to launch a murder investigation after a post-mortem examination is completed today at Cork University Hospital, by Assistant State Pathologist Dr Margaret Bolster. Mr O'Callaghan's sister, Sheila Thornhill, appealed at the scene for people to support the garda investigation. "I have never seen Joe be so good as he has been in the last couple of days," she said. "We are all shocked. Joe has three grown-up children and was always happy in himself." The devastated woman urged people to support gardai. "Find whoever did it to him," she added. Ms Thornhill was supported at the scene by her brother, George. Mr O'Callaghan's distraught wife, Angeline, who had moved to Ireland from Zimbabwe, was being comforted at Galway's Lane by members of the area's African community. She arrived home from working a nightshift at 8am yesterday to discover Mr O'Callaghan lying in a pool of blood in the hallway with apparent head injuries. Part of the front door was broken, with indications it had been kicked in. 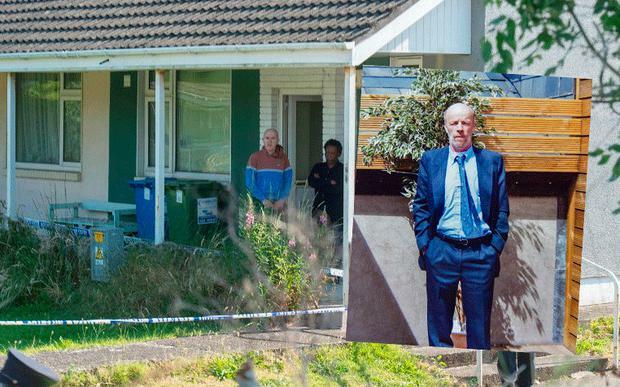 Blood spatters were found in two rooms of Mr O'Callaghan's bungalow. She ran to the house of neighbour, John O'Sullivan, to raise the alarm. One garda source said it appeared that the pensioner's head injuries were consistent with a severe and prolonged assault. It is not believed a weapon was used. A neighbour, who asked to be unnamed, said he heard shouts of 'open the f**king door' at around midnight but then presumed a loud bang was Mr O'Callaghan slamming an internal door and ending the matter. Another neighbour reported seeing a young man in dark clothes acting suspiciously on Sunday night along Galway's Lane. The house was cordoned off pending a forensic examination by members of the garda Technical Bureau. A garda Dog Unit was also deployed to Galway's Lane.